Firth coach Scott Adams (center) coaches during a game. It came as a surprise to many when Adams stepped down two years ago to spend more time with his family and he accepted the athletic director’s job along the way. 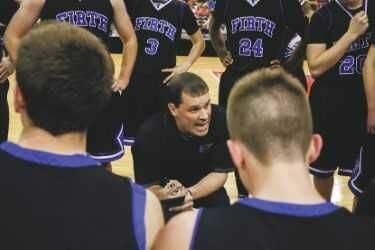 Adams spent two years on hiatus and, as he puts it, the time is right for a return to coaching basketball at Firth. Adams has been pursued by several other high schools over the past two seasons, but it just wasn’t the fit that he wanted, he said. He says it would have interfered with some of what he wanted to do and that was to spend more time with his kids and to be able to watch his daughters play sports as well. Adams said either the offers were not quite what he has had at Firth, or they were intriguing. Some have offered extended terms on a contract and others thought he would come to their environment for next to nothing, but none of them felt right. The offers reportedly have come form some high schools in the state and out of state and there has even been an offer or two from some small colleges, just nothing that grabbed Adams and made him want to accept the offer. Beginning in 2007, Adams coached teams at Firth that ran off a string of four straight championships. His teams won three more championships in 2014, 2015 and 2016. Adams will take over the basketball program immediately and will begin organizing his summer camps and will remain in the athletic director’s position.